I have never conducted a trial where I followed the rules laid down by the law professors who have never tried a case. In every trial, I must ask questions I don’t know the answer to. I allow witnesses to explain, even on cross examination, because my opponent will elicit the same information on redirect so the explanation will come out anyway. I prefer to let the witness explain and then poke holes in the story to show how ridiculous it is rather than waiting hours if not days for the chance to do so after redirect. I want you to know that whatever you do in trial is okay provided you understand why you are doing it and what the purpose is. Learning tricks or methods does not make you a trial lawyer. To make the transition, you must become self actualized. You must learn to be aware of who you are and how you feel in the midst of this blood sport we call trial. It is only when we stand confident in the courtroom, knowing ourselves and what we want to accomplish, that we can be “in the moment,” absorbing the developing trial and steering it to the final conclusion we seek. In my last trial, which ended a week ago after nine weeks, the defense argued that the company that was the subject of the legal malpractice case was a “tiny, little company” with little prospect for success so Plaintiffs could not show that the defendant caused the loss because it was going to fail anyway. I wracked my soul for a way to overcome this most effective of arguments that my opponent had no doubt repeatedly used to amass an overwhelming win / loss record. Conversations with the jury after their eight figure plaintiffs’ verdict affirmed that the jury felt that the brief statement in my final, final argument swayed the fence sitters on the jury. The argument was the product of my being in the moment, and feeling the outrage of an unfair attack on a good business for the sole purpose of avoiding responsibility. When I focused on those feelings, it was easy to form the argument that sent the jury into the jury room with a clear vision of where I wanted them to go. 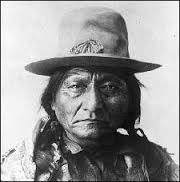 Sitting Bull became who and what he was, through the desire to be in the fray and the courage of his commitments. Those wanting to be warriors on the courtroom battlefield will do well to understand that what we are and how we feel about what we are doing is far more important than the rote rules foisted on us in law school. To be a trial lawyer, you must have courage to become who you really are and the determination that regardless of the odds against you, you will go to trial, you will love your clients, and you will win the day for them. Unless you have the courage to commit as Sitting Bull did to becoming a warrior, you will never become a warrior in the courtroom.